For the barbecues you'll be hitting this weekend, you need: Beer. Wine. And a little something extra. All of the above can be found in one spot at Venokado, the sleek new shop open today on Fountain Avenue. You'll have to pay attention to find the place—it's in that oddly triangular building between La Brea and Fairfax that used to house a random, divey market. 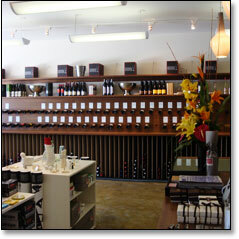 Once inside the modern (but still oddly triangular) new incarnation, head left for the wall of rare but mostly affordable bottles selected by the trio of wine-loving women—your favorite kind—who run the place. They got their hands on a few bottles of Sea Smoke Pinot Noir, as well as some biodynamic Domaine Olivier Pithon (we hear you can taste the dirt...in a good way). You'll also find some rare brews like Bohemia, Hitachino's Red Rice Ale and that rarest of specialties, PBR in a can, inside the beer cooler at the back. And unlike any wine shop of note you've ever entered, you can also head over to the right for piles of unique design-y goods, in case you need a suede baseball or trippy money clips from Copenhagen to go with your Merlot. They're big into unusual gift boxes here, to keep your status as VIP Party Guest intact. Not that there was any question.